Director's MessageSummer OpportunitiesStaff's FAQsFormsHiring InformationApply Today! If you're looking to send your kids to an overnight residential camp on a beautiful property where they will experience TONS of fun throughout the entire week AND also learn about the amazing love of Jesus in the midst of it all at affordable rates, you're in the right place! Who is eligible to register for camp? At SMC we know how expensive it can be to send your child to camp. 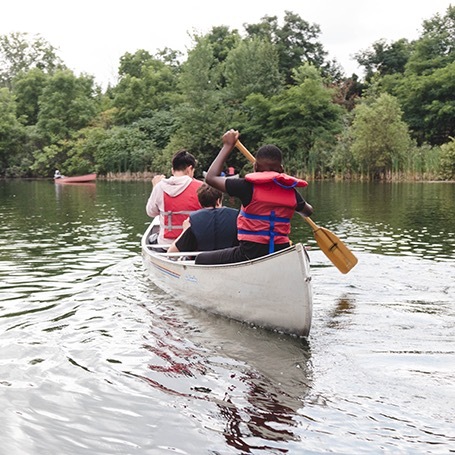 We also know the amazing life changing experience that camp can be for kids and that's why it's our goal to be able offer camp to families within the GTA despite the financial restraints that may exist. We accept campers through an application process that is based on income. All the registration spots available are highly subsidized so if upon registering for camp you qualify for the subsidy we will let you know and you will be able to complete your registration and pay your nominal fee. Spots at camp are in high demand and we have a wait list each year. Don't delay and fill out an application to register your child for camp today! Scott Mission Camp is located about 1 Hour northwest of Downtown Toronto in the beautiful town of Caledon, Ontario. 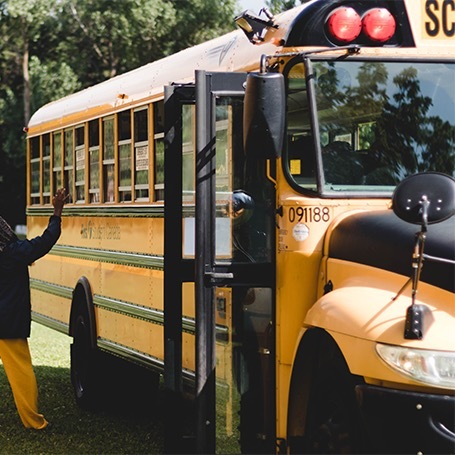 When it comes to transportation to and from camp on the first and last days of camp, families have 2 options. For those located in the city, we have a bus pickup located Downtown, Toronto near the Scott Mission. From here we do check in and then load the buses to head up to camp for the week! For those interested, parents/guardians can drop their kids directly to the camp located in Caledon at 3852 The Grange Sideroad. Check in at camp begins at 11:30am on Monday. We operate on a 4:1 child to counsellor ratio. There are 8 children in a cabin group with two counsellors. Our counsellors are either in University, College or High School and they are interviewed and screened before working at Camp. 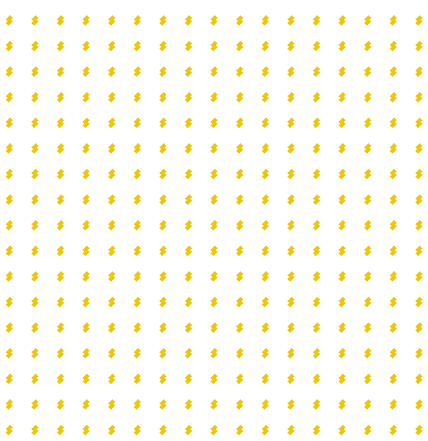 In addition to these counsellors we provide a dynamic program staff which includes a nurse, lifeguards, program coordinators and child management supervisors. These staff are always qualified professionals and many are year round staff of The Scott Mission. We consult with a local Doctor and have short drive times to health clinics and hospitals. To further ensure the safety of our campers and staff, all campers are required to agree to and follow our Camper Code of Conduct. At camp we are committed to providing great meals for your children. 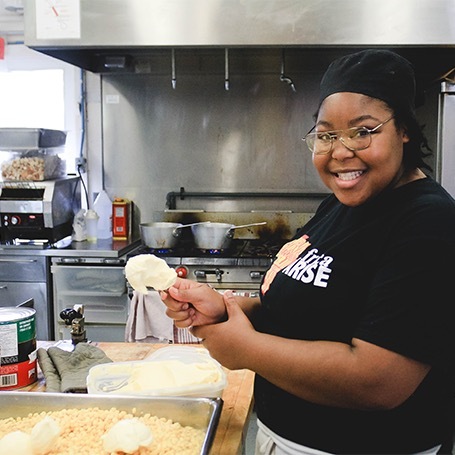 We hire 2 Cooks each summer and 5 Kitchen assistants who work hard to provide great meals to keep the kids fueled up with enough energy to get through the fun filled days! Each day we provide children with 3 full meals (breakfast, lunch, dinner) with a nice dessert included with their lunch and dinner! We also provide them with an evening snack as well. We are also conscious of different dietary needs and restrictions and do our best to accommodate any requests made. Please make sure to include specific dietary needs and restrictions on your application. We are usually able to accommodate different needs but if for any reason we are unable to we would let you know. Where will my child sleep at camp? The Scott Mission Camp has cabins which hold eight campers of the same gender and similar age and two counsellors. What time do I need to drop of and pick up my child? Toronto drop off/pick up: 11:00am Monday morning drop off and pick up is 11:30am on Saturday. Camp drop off/pick up: 12:15-12:30pm Monday morning drop off and 10:15-11:00am pickup on Saturday. What kind of staff will be looking after my child at scott mission camp? Our 4 year-round staff and 45 summer staff are serious about serving God and serious about providing an excellent camp experience for our guests. We have a 4:1 camper to counsellor ratio. Staff must be at least 16 years of age to be employed at SMC and all staff are screened before working at camp. We provide a dynamic program staff which includes a nurse, lifeguards, program coordinators, and child management supervisors. These staff are always qualified professionals. My child has allergies and other health problems, do you have a camp nurse? Every summer we hire a qualified camp nurse for the safety of both staff and campers. If an emergency arises we have short drive times to health clinics and hospitals. How many kids come to each session? There are roughly 96 kids that come to each session, for a total of 672 kids for the summer. A session starts on a Monday morning and ends on Saturday morning. That makes a total of 6 days/5 nights at camp. Do you offer camp programs for children with special needs? Can my children all be in the same cabin? Can my child come to camp for two or more sessions? Unfortunately we can only allow your child to come to camp for one session. This way we are able to provide more space for all children who apply. Can my child and her friend be in the same cabin? We attempt to place children of the same age groups in cabins together. If you have a specific request for a cabin mate for your child be sure to note that on the camper application form. We will attempt to accommodate all placements when possible. Can I visit my child at camp during their session? If you would like to visit your child at camp we do require that you call two days before you would like to visit. Can I call my child while they are at camp? Unfortunately we do not allow parents to call and speak directly with their child as this may cause unnecessary homesickness. We would be glad to pass along any messages and let you know how your child is doing. Of course, if there is an emergency then we will surely allow you to speak with your child.